The "fighting paper of the National Socialist movement of Greater Germany," or “Kampfblatt der nationalsozialistischen Bewegung Großdeutschlands,” as it called itself, had its origin as the Münchener Beobachter, or Munich Observer, an anti-Semitic semi-weekly scandal-oriented paper which in 1918 was acquired by the Thule Society and, in August 1919, was renamed Völkischer Beobachter. Major Ernst Röhm and Dietrich Eckart persuaded Röhm’s commanding officer, Major General Franz Ritter von Epp, to purchase the Völkischer Beobachter in December 1920, by which time it was heavily in debt, for the NSDAP from the Thule Society for 60,000 Papiermark. It was never definitively established where Epp got the money, but it almost certainly came from secret army funds. This demonstrates a possible early link between the army and right wing radicals like the Nazis. After the Nazis acquired the paper, Eckart became the first editor. The circulation of the paper was initially about 8,000, but it increased to 25,000 in autumn 1923 due to strong demand during the Occupation of the Ruhr. In that year Alfred Rosenberg became editor. 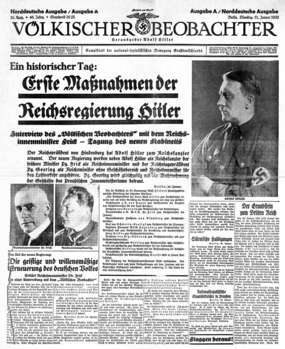 With the prohibition of the NSDAP after the Beer Hall Putsch of 9 November 1923, the paper also had to cease publication, which resumed, however, on the party's refoundation on 26 February 1925. The circulation rose along with the success of the Nazi movement, reaching more than 120,000 in 1931 and 1.7 million by 1944. ↑ Shirer, William L. (1960). The Rise And Fall Of The Third Reich: A History Of Nazi Germany. New York: Simon & Schuster. ISBN 978-0-671-62420-0. ↑ Schwarzwaller, Wulf (1988). The Unknown Hitler : His Private Life and Fortune. National Press Books. p. 80. ISBN 978-0-915765-63-8.